This incredible waterfall takes a lot of level hiking to get to, but Colonnade Falls with the bonus Iris Falls are worth every step. Take the Bechler Meadows Trail that begins at the historic Bechler Ranger Station. Make sure that you continue on the Bechler Meadows Trail by staying right at the junction with the Boundary Creek Trail. 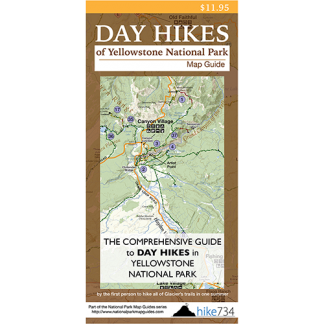 The first 3.7mi/5.9km of this hike is on a level trail through a lodgepole forest with a few scattered views to smaller meadows. The trail enters into the broad Bechler Meadows where you cross over Boundary Creek on a suspension bridge. Depending upon the time of year, the meadow can have varying degrees of marshy ground, with late summer usually being the most dry. Once out in the middle of the meadows, a look back gives you a view of the Teton Range to the south. A few streams through the meadow may be navigable via opportunely placed logs, but fording the Bechler River is unavoidable. The river isn’t moving fast and the footing is good, but it can easily be thigh deep. Check with the rangers before beginning the trip to get an idea of its hazard, especially if hiking before mid-July. Once the river is forded, the trail goes in and out of trees, eventually becoming a forest walk as you turn up Bechler Canyon. This section, as it works up the canyon, is wonderful. Keep an eye on the ridge across the river for Ouzel Falls as it appears to pour out of the rock. The Bechler River runs below the trail and the lush vegetation is a great change from the meadows. As you follow the river up, massive rock slides provide excellent habitat for pikas. You will hear the roar of the falls as you reach the junction with the spur trail that takes you to a perfect overlook of the waterfall. Colonnade Falls is powerful, as the entire Bechler River pours over two shelves, the second dropping 100ft/30m. After returning back to the junction, continue upstream on the trail for different views of the falls. Continue past Colonnade Falls on the trail for another 0.4mi/0.6km to Iris Falls, which is another impressive waterfall. While not as high as Colonnade Falls, this waterfall is wider. A peninsula juts out in front of the falls and allows you to stand at eye level and feel the mist and spray from the falls. Off to the side of the waterfall, there is a great spot to eat lunch and enjoy its beauty and power before heading back. 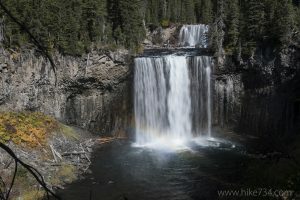 While the Bechler Meadows Trail is the most direct route to these falls, the Bechler River Trail and Rocky Ford Cutoff Trail can be taken, providing a few different options. Doing so will allow you to see more of the Bechler River, but adds more distance to the day.